Heat oven to 375°F. Unroll pie crust on work surface. Cut into 16 wedges. For 1 hat, spoon about 1/2 teaspoon chocolate chips along narrow edge of 1 wedge. Starting from same edge, roll toward point, enclosing chocolate chips and leaving 4 inches crust unrolled between roll and point. Place on ungreased cookie sheet 1/2 inch apart. Bend and shape hat as desired. Repeat with remaining dough wedges and chocolate chips to make 16 hats. In small bowl, mix sugar and cinnamon. Sprinkle over hats. Bake 11 to 14 minutes or until light golden brown. Cool 1 minute; remove to cooling rack. To ensure the sugar and cinnamon sticks, you may want to brush the hats with water first. 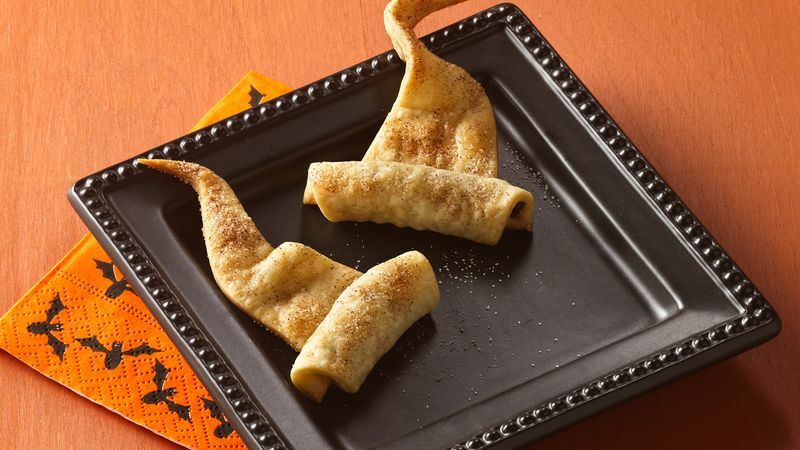 If you're interested in another sweet treat with cinnamon, check out the recipe for Cinnamon Roll Bats on pillsbury.com.